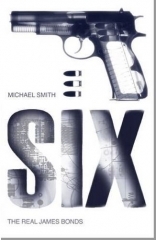 SIX: The Real James Bonds: The Complete History of the Secret Intelligence Service is an upcoming book from Michael Smith, a former intelligence officer and journalist. It will be published by Dialogue on 7 May 2010 in the UK. Little if anything to do with James Bond, the book will tell the tale of the real agents of MI6 that inspired such fictional characters as James Bond and George Smiley. From the Kaiser to the Taliban Britain s real spooks are revealed in this intriguing biography of the country s most secretive of secret services. Six is the full story of 100 years of espionage by MI6, the organisation still seen as the model for the world s spies. This book tells the truth about the men and women who inspired fictional characters such as James Bond and George Smiley. It begins with the creation of the British Secret Service in 1909 as the First World War loomed, and comes right up to date, detailing the work of MI6 officers in Afghanistan. Six focuses on the human factor, recounting hitherto untold tales of derring-do and exposing villainous traitors whose identities have until now been closely guarded secrets. Using hundreds of previously unreleased files and interviews with key players, it exposes the truth behind the failures and successes, including the real story of the Iraq scandal, naming the heroes and villains alike.